Are you interested in an outdoor model? 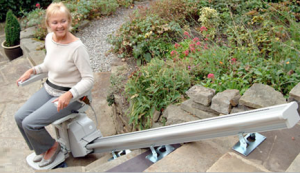 We have arranged a number of outside external lift installations to help enquirers who wish to access terraced gardens, driveways or garage spaces and who are currently finding it difficult to enjoy their outdoor space because of mobility or access restrictions. We do not offer outdoor lift rental or hire, however why not let us take the strain by calling us on 0800 007 5050 or by arranging a quote for a new outdoor installation. We can arrange installations of new straight and curved outside models to go up a straight or curved incline. If there are multiple terraces then you may need a couple of straight rails with a garden hand rail in the middle if there is a landing-type flat platform or terrace between the runs of steps. Alternatively a curved system can be installed for the whole run. We very rarely have reconditioned outside brands available as more often than not the installations are installed on a made to measure track. 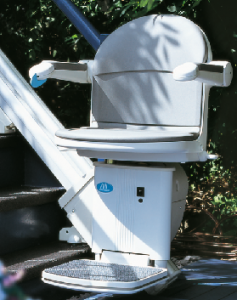 This is because most external steps all have a different slope, height and fall than a standard 13 step indoor stair lift might face. You can easily get to your porch or to your car once you install an external lift for the steps. These will ensure that you move around with ease and continue with your life in just the same way you always have. There are many models that might be suitable and if you do not choose the exact one that suits your own situation, you will end up spending your money on something that won’t be right. There is a reason why some people take their time in selecting an outdoor lift; they want nothing but the best. If you read several reviews, you will realize that resistance to harmful weather conditions is one of the things that you need to consider. There is a difference between indoor and outdoor lifts. While the indoors type is protected from all the elements of weather, the external type is exposed to all of them. It’s important then to ensure that you choose those which can resist all the weather conditions such as rain, sun or snow. These are the elements that are likely to affect any electro-mechanical device and might cause malfunction. All of the models we now install come with a sturdy waterproof cover to keep the seat dry when not in use, and to protect the assembly from excess moisture. Be assured that all the ones available from our partner manufacturers have all been tested outside to the fullest extent and we stand by their quality and reliability. Your safety while at home or at the office is of great importance. This is the reason why people buy models that have safety sensors. Just the same way dust and other small particles are blown around by the wind, so are larger objects or branches/twigs that could obscure the track and may result in accidents and injuries. However, if you have chosen carefully, with helpful advice if required, you will have made sure that it had safety sensors fitted, along with any other feature you need. This pauses the lift on the track so that it doesn’t risk getting de-railed so allowing the user to reverse and summon assistance to clear the track. We can install a straight external lift outside in a morning or afternoon. A curved model may need a day depending on how long the track is and what material the track will be fixed into. For example some people have granite flagstones or something similar on their drive which would take a wee while to drill into to secure the track. 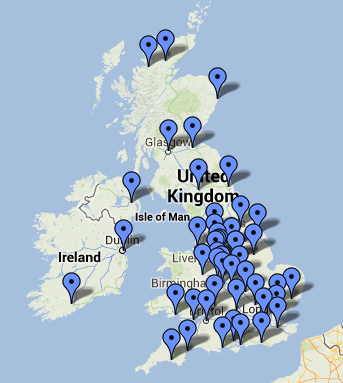 It all depends on the site survey, when we would be able to give you a more accurate idea. Call us on 0800 007 5050 to arrange yours.